Since the first zip line in the U.S. debuted on the slopes of Maui’s Haleakala Crater in 2002, this high-flying activity has soared across the 50th State—and other destinations across the country, as well. It’s difficult to find courses that actually rival the intense tropical beauty that unfolds on these lofty pursuits in the Hawaiian Islands. While creating a safe, eco-friendly environment for witnessing the unique landscapes of each island, operators have adopted responsible principles to conserve lush natural surroundings. Count on learning about Hawaii’s rich culture and history while soaking in spectacular eye candy. If you’re a bit hesitate to jump on the bandwagon, ask questions. Responsible zip line companies design, build, operate and maintain their courses according to a high, stringent set of professional standards, such as those established by the Association for Challenge Course Technology (ACCT). Here are seven of 14 ways to soak in the pleasures of paradise with a zip lining experience that will literally and figuratively sweep you off your feet. Spreading its wings across Hawaii, pioneer Skyline Eco-Adventures engages with a pair of Maui courses in completely different environs. Adrenaline addicts can soar through Upcountry Maui’s lush forests along the slopes of Haleakala or race above Kaanapali’s sweeping coastline on an eight- or 11-line option with breathtaking views of the Pacific Ocean and offshore islands. The former thrills with five lines and an Indiana Jones-style swinging bridge tucked within a towering forest of fragrant eucalyptus trees. Blending two adventures, the “Bike & Zip” follows a sunrise at the 10,000-foot summit with zip lining and a downhill bicycle safari. Skyline’s Akaka Falls tour on the Island of Hawaii traverses above deep ravines and tropical farmland along seven lines—including a thriller above 250-foot Kolekole Falls. The grand finale rips above a 450-foot ravine and waterfall for a minute-plus rush. Gorgeous views of Kauai’s south shore create “ooh and aah” moments as Skyline Poipu’s eight-liner blazes above multiple lush valleys with a mountain and ocean backdrop. The final line elevates the scream factor with its "walk the plank” takeoff deck perched above a sheer cliff. 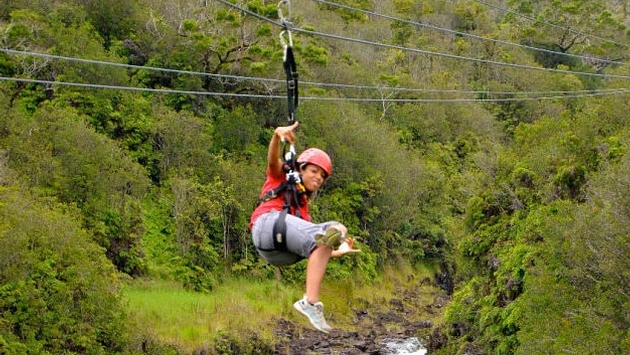 Nine zip lines, five sky bridges and a rappel make Kohala Zipline’s three-hour Kohala Canopy Adventure the only “full canopy” zip line tour on the island. Options include a three-hour outing or the full-day “Zip & Dip” that packages the Kohala zip line, lunch, short hike and a swim beneath a private waterfall. Partnering with Zipline Through Paradise for the only all side-by-side, dual-track aerial adventure on the island, KapohoKine Adventures takes flight with a 3.5-hour trek that dazzles with eight dual-track lines – including a 2,400 footer that soars 160 feet above multiple waterfalls. The views are nothing short of spectacular when flying above a rainforest and through Honolii River gorge on the lush northeastern coast above Hilo. A limited availability upgrade couples a nature hike through that same rainforest with an optional swim in one of the many private waterfalls. Newest among its menu that ranges from four lines to a “Hike/Zip” combo, Piiholo Ranch Zipline has debuted its seven-line treetop tour with lines ranging in height from 175-930 feet. This one takes you high above the Kahakapao Valley from tree to tree to experience a flying sensation by swooping down deep into the valley, sailing through canopy tunnels and exploring the course’s Pirate Ship Tree House. The company partners with Hike Maui for the full-day combo trek that follows zip lining with hiking down private trails off Hana Highway to a pair of refreshing waterfalls. Swim and plunge into the clear pool beneath the falls or simply unwind on terra firma while soaking in the scenery. Set to return this summer, Kapalua Ziplines’ full moon zip enchants with 2.5 hours of magic along three lines enhanced with Maui moonlight. A 3.75-hour day trek continues to awaken the senses while flying above the West Maui Mountains via seven zip lines covering two miles of parallel cable lines. From the company’s mountain outpost, a four-wheel drive Polaris Ranger transports passengers to the upper reaches of the adventure course. 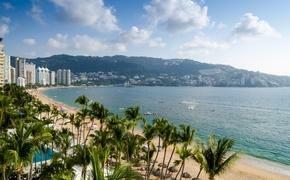 This tour wows with breathtaking panoramic views of three offshore islands, exotic forests and a 50-foot waterfall. Next up, “14 Hawaii Ziplines To Experience in 2017: Part Two” will take you to high-flying zipline options on the islands of Oahu and Kauai.